Am I Writing for 5th Graders? I recently came across a fascinating article, in which the author analyzed and calculated the reading level of a bunch of notable works, ranging from Goodnight Moon and Hemingway’s The Old Man and the Sea all the way to the Affordable Care Act (yeah, I know, but bear with me). There is a thing called the Flesch-Kincaid index (among some others with similarly weird names like Gunning-Fog) that lets you input a piece of writing and spits out the grade level. Meaning how many years of education you need to read it. It counts stats like syllables per word, characters per word, and words per sentence. The surprise: Hemingway was mostly writing for 4th graders. I was as surprised as the author of that article. I guess I automatically assumed that good writing would result in a higher reading level. But when you look at this graph the author assembled, it’s rather the opposite: Those writers we think of as “good,” the ones who are universally admired, write at a lower reading level than we’d expect. J.K. Rowling, Stephen King, Dan Brown, even Ayn Rand, all scored at a reading level below 7 when averaged in the aforementioned indices. Which made me immediately question whether I should have used the phrase “aforementioned indices.” Because guess what scored at the highest level, at 13? The Affordable Care Act. And no one wants to read that. 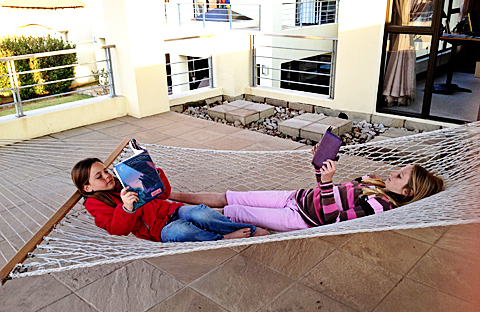 My kids captivated by their books. The lower the reading level, the more fascinating? I’d say it still has to be an interesting story, no matter what. But keeping it simple seems to sell books. My curiosity piqued, I did the next natural thing: I calculated the readability score of some of my own work. An article I once wrote about an orphanage in South Africa that I was extremely proud of at the time, Giving Hope at New Jerusalem, got a whopping 11.2. Perhaps that explains why hardly anyone ever read or commented on it. I then ran it a third time, this time using my entire book, Kilimanjaro Diaries: Or, How I Spent a Week Dreaming of Toilets, Drinking Crappy Water, and Making Bad Jokes While Having the Time of My Life . Amazingly, all 76,000 or so words of it took just a few seconds to be analyzed. It scored at a reading level of 9. (I’m guessing the title alone was responsible for at least a few decimal points by itself.) I’m right between Michael Crichton and Mitt Romney on the readability chart. While writing for an audience of ninth graders doesn’t seem bad, I know I can do better. If I want to join literary greats like Hemingway, perhaps I need to be aiming for those fifth graders. Note: This article scored 8.3. Now go check the readability of your own writing at readability-score.com. This is so cool! I tested my most recent post and it scored a 9. Now I also want to challenge myself to get it lower. Isn’t it funny? When I first started writing, you couldn’t have made me believe that I should aim for a middle school audience. And it’s not something you can just do. Or at least not me. You have to have written quite a bit to evolve your style so that you can do it more or less automatically.